Having collected and installed a Bridgeport CNC vertical milling machine into our workshop, we knew straight away that we could put it to the test with this custom Harley Davison motorcycle yoke. 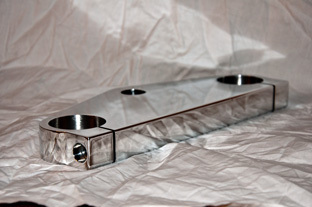 Machined from billet aircraft grade aluminium for strength and produced to the customers specification to adapt a pair of Yamaha forks to fit the Harley. The yoke was finely machined on the mill, then highly polished with wet'n'dry before being polished to produce a brilliant reflective finish. The only problem that we encountered was that the final piece was a devil to photograph! 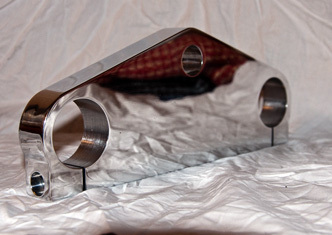 Item was featured on the website home page in December 2011.